The international charity that runs the $2m centre says officials have told it that the land is needed for national security purposes. But the charity suspects a different motive - profit. It points to plans backed by the national park director for an eco-development by a company co-founded by his daughter. The Vietnam Bear Rescue Centre is sited in a temperate, lowland valley in Tam Dao National Park - a swathe of lushly forested mountains to the north-west of Hanoi. 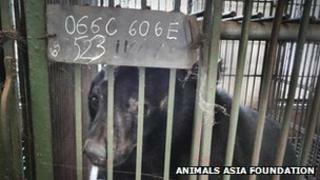 It houses more than 100 endangered bears rescued mainly from the illegal bile-farming industry. In that industry, bears are kept caged. Digestive bile is forcibly extracted from their gall bladders, to be sold on the black market for use in traditional medicine. Animal rights campaigners have long attacked the practice as barbaric, and it is banned in Vietnam. Animals Asia, the charity which runs the sanctuary, says it would take two years to find a replacement location, and worries how it would care for the rescued bears during this time. "It's no understatement to say that everyone is living in fear, considering that our bears and staff have all been given notice to quit with nowhere to go," says its founder, the British campaigner Jill Robinson. It fears it would receive no compensation for lost infrastructure, and says 77 local staff would lose their jobs. Animals Asia also claims the Vietnamese government would breach its legal obligations to the charity, under agreements both have signed. It is calling on Vietnam's prime minister, Nguyen Tan Dung, to abandon the plans. The country's Ministry of Agriculture, which oversees Tam Dao National Park, says the Ministry of Defence wants the land for national security purposes. In October, Ministry of Agriculture officials told Animals Asia that they would be seeking the prime minister's approval for the eviction to go ahead. The ministry is believed to have submitted its final report to the prime minister, for him to decide. Animals Asia, however, questions the timing of the Ministry of Defence's push to have the rescue centre evicted. It points to the fact that the director of Tam Dao National Park has backed a scheme to use at least part of the land demarcated for the sanctuary for a tourist development. The park director's daughter, Do Thi Ngan, was one of the original founders of the company behind the proposed development, with 10% of its shares. One state-run Vietnamese online newspaper, the Justice of Vietnam, has raised questions about the address that the company - the Truong Giang Tam Dao Joint Stock Company - has listed as its headquarters on its official registration document. The property at the address is reportedly a convenience store, whose owner knew his nephew had registered the company there, but knew nothing about its activities. The BBC was unable to contact the company for comment. Speaking to the BBC's Vietnamese Service at an early stage of the BBC's investigation in October, the director of the national park, Do Dinh Tien, confirmed that he had heard about the Ministry of Defence's stance. But he said that no decision had been made on whether to relocate the bear sanctuary. "We are just discussing all the possibilities and how to make this reasonable… to ensure national security, and at the same time, make sure that the centre can function normally." Mr Tien also denied having received any requests from companies seeking to use the land on which the sanctuary is built. "It's just gossip, only rumours," he said. But evidence suggests this is not the case. The BBC has subsequently seen a document in which Mr Tien specifically backs the company's bid to submit such development proposals to his ministry. This would appear to be a conflict of interest. A Ministry of Defence document also indicates there may have been direct contact with the park director's office on the subject of stopping the bear sanctuary from expanding on land that had been previously demarcated for the sanctuary, but which was also sought by the developers. Mr Tien has said he would answer a list of questions sent to him by the BBC, but was unable to do so before our publication deadline. Animals Asia says it fears that the national security argument is only a pretext for evicting the sanctuary. The charity argues that - if the sanctuary were to be evicted - nothing would prevent the Ministry of Defence from subsequently lifting its national security restrictions. This, it says, could clear the way for the approval of the tourist development. When the BBC asked the park director's daughter, Do Thi Ngan, about her apparent links to the development company, she seemed to deny being a shareholder, despite being listed as a co-founder on the official company registration document. She then declined to answer more questions on the phone. "It's personal information, I don't want to talk about it, unless you are in an investigation, with police, and show official documents then I'll answer," she said. There is no suggestion that she is the subject of such a police investigation. But it is not clear why she would appear to be involved in plans that require her own employers losing the use of land. For - in a curious twist - Ms Ngan actually works as an administrative assistant at the bear sanctuary itself. No official reasons have been given by the Vietnamese government as to why its Ministry of Defence has - seemingly out of the blue - decided that the land at issue is of importance to national security. The ministry did not oppose the building of the sanctuary which was set up with full government approval. The BBC was unable to contact any defence officials for clarification. And the Ministry of Agriculture failed to respond to a list of questions. Meanwhile, Animals Asia has been campaigning hard to halt any eviction. It has gained broad international support, pointing to letters signed by dozens of politicians worldwide, including members of the US Congress and British MPs. A number of celebrities have also lent their support, including the comedian, Ricky Gervais and the actor and author, Stephen Fry. And it would appear to have some support within the Vietnamese establishment. One member of the country's National Assembly, Duong Trung Quoc, told the online newspaper Vietnamnet last month that eviction "would do harm to our country's image". For now, the sanctuary's bears can socialise and enjoy the large outdoor enclosure of their new-found home. But the prospect of eviction is - in Jill Robinson's eyes - one that is "too horrible to contemplate". Having to re-cage rescued bears, she explains, risks re-activating the symptoms of their trauma, and all "because of a decision that has not one shred of morality behind it".